Allergic reactions come in many forms, some of which are followed by joint pain. Allergies to medications and food can include symptoms of joint pain. Some substances produce immediate allergic reactions, while others cause delayed reactions and serum sickness that include joint pain. In addition, insect stings often cause allergic reactions in addition to swelling and pain. Finally, any allergy causes inflammation, which can trigger conditions that involve joint pain, such as rheumatoid arthritis. Allergic reactions to medications are classified based on how the reaction occurs. Type 1 allergic reactions usually occur immediately after the administration of a particular drug. These reactions include symptoms such as urticaria and wheezing. Another potential symptom is angioedema, or swelling. This can occur at the site of contact with the offending medication, including the joints, or it can be more generalized and affect the entire body. Swelling can make it hard to move your joints. Serum sickness is a type 3 allergic reaction. It can occur hours or days after exposure to an allergen. Symptoms of serum sickness include hives, fever, joint pain and swollen glands. In serum sickness, the immune system reacts to a foreign protein by forming immune complexes that can cause inflammation and can be deposited in the joints, causing pain. While most people react to insect stings and experience some pain and swelling, some people are actually allergic to insect venom. These reactions go beyond normal responses to insect stings and include symptoms such as swelling of the face and tongue, difficulty breathing and nausea. Rarely, insect stings can also cause serum sickness with joint pain. Since this can be a delayed reaction, it might be hard to remember the insect sting that triggered the reaction. This should not be confused with Lyme disease, which is a bacterial disease that occurs after tick bites. Lyme disease can cause joint pain, but it is related to the invading bacteria, not an allergy to the tick bite. Rheumatoid arthritis is an autoimmune disease in which the immune system mistakenly mounts an attack despite a lack of foreign substances. It causes pain and swelling of the joints. 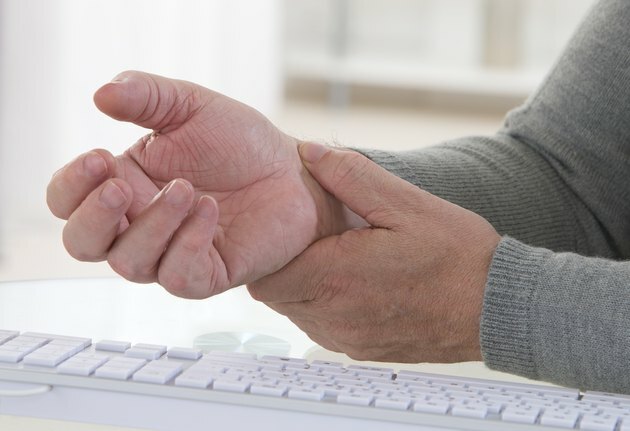 Although the exact causes of rheumatoid arthritis are unknown, the Innate Health Center for Food Allergies in Seattle states that there is a large body of evidence linking food allergies to rheumatoid arthritis. The inflammation caused by a food allergy may trigger or worsen rheumatoid arthritis.